Maybe your dad used a Pyrex measuring cup whenever he made pancakes, or your roommate always baked her famous lasagna in a rectangular Pyrex pan, or your grandmother had a set of the brightly colored Pyrex mixing bowls on her kitchen counter. That’s why, for most of us, it’s impossible to recall the first time we encountered Pyrex: Almost from its debut in 1915 as the first glassware for cooking, Pyrex has been a ubiquitous part of the American kitchen. To celebrate the Pyrex centennial, the Corning Museum of Glass has organized an exhibition detailing the brand’s historic legacy called “America’s Favorite Dish: Celebrating a Century of Pyrex,” up through March of 2016. Pyrex’s utilitarian, streamlined designs—and even its technical-sounding name—implied that cooking was a science to be mastered using mathematical perfection. And in fact, the temperature-resistant glassware has its roots in the groundbreaking laboratories at the Corning Glass Works, a company that initially manufactured glass for industrial purposes. Indeed, the kitchenware line we take for granted once provided the material for the world’s largest telescopic mirror. Top: A two-quart covered casserole dish produced by Pyrex in 1960. Above: Left, a set of mixing bowls in the Dots pattern, circa 1970. Right, a Pyrex liquid measuring cup from 1953. Courtesy the Corning Museum of Glass. Founded in 1851 near Boston as the Bay State Glass Company, the business moved to Brooklyn briefly before finding a permanent home in Corning, New York, in 1868. At that time, the company was focused on technical products, particularly those needed in the booming railroad industry, from glass battery jars to lenses for train signals. An engraving from the 1870s showing the Corning Glass Works cutting department. Courtesy the Corning Museum of Glass. In the early 20th century, Corning scientist Eugene Sullivan worked to develop a unique glass formula that could withstand this stress, using his previous experience working with Otto Schott, inventor of the first glass recipe incorporating boron. “Boron atoms arrange themselves in the glassy network of atoms in such a way that they make the overall piece of glass change size less, almost two-thirds less, than standard glass lacking boron,” says Cook. In 1909, Corning began marketing its borosilicate glass products as Nonex or CNX (Corning Non-Expansion). Eight dishes from the first set of Pyrex, circa 1915. Courtesy the Corning Museum of Glass. During the early 20th century, glass wasn’t used for cooking because it couldn’t withstand extreme temperature fluctuations. Instead, cooks relied on earthenware, cast iron, or tin vessels that could be heated easily. However, as the company began looking for novel ways to use its durable glass, its staff was steered toward the development of consumer kitchen products by the wife of one Corning physicist. Bessie’s experiments revealed that the borosilicate glassware heated quickly and evenly, its transparency made it easier to monitor the progress of a dish while baking, and it was easy to clean. The company soon created a new division focused on consumer products and launched its Pyrex line with 12 clear ovenware dishes in 1915. “It was a challenge to convince people to use Pyrex,” says Brumagen. “All the early ads say things like, ‘Yes, you can cook in it!’ or ‘Bake in glass!’ It was just a foreign concept to consumers, so Corning had to do some persuading.” In its early Pyrex marketing, the company purposefully used the jarring imagery of open flames visible through the clear glass to convey the potential of its new products. An ad for Pyrex “Top-of-Stove” ware from 1936 shows the flames through the pan’s clear glass. Courtesy the Corning Museum of Glass. The Pyrex name got a major publicity boost beginning in 1929, when astronomer George Ellery Hale commissioned Corning to produce a 200-inch glass disk (nearly 17 feet) for a huge new telescope in California—twice the diameter of the largest existing telescopic mirror at the time. Manufacturing such disks required specialized materials and extreme precision, for if the glass expanded and contracted unevenly, its imagery would forever be distorted. Corning physicist Dr. George V. McCauley designed a gigantic disk for Hale using the Pyrex borosilicate formula and incorporating a complex honeycomb surface pattern to lighten the object’s weight. Though an initial attempt at the 200-inch disk failed, McCauley’s team successfully completed the task in December of 1934, after which the disk was gradually cooled for 10 months through a process known as annealing. Thousands of people flocked to railway lines as the giant Pyrex shipping crate carrying the glass made its way from New York to California, where it would be carefully ground, polished, and finally installed in 1948. Left, the telescope disk’s shipping crate is prepared for transport in 1935. Right, the disk’s diameter is measured after being cast. Courtesy the Corning Museum of Glass. As the Pyrex team attempted to battle a slump in sales during the 1920s, Corning native Lucy Maltby was spending her graduate studies investigating Pyrex and the ways it might be improved, finally convincing the company to hire her in 1929. “Maltby was part of this wave of home economists in the professional world—that was the new women’s career at that point,” says Brumagen. Part of Maltby’s role was to be the voice of the consumer. “She was the one to say, ‘Hey, this cake dish is really fantastic but it has no handles, so every time I pick it up with cake batter in it, my thumb goes right in the batter,'” Brumagen explains. Maltby was the one to point out that their pans were too big, meaning you couldn’t fit two of them in the oven at the same time, and something like a double-layer cake would take twice as long. The Corning staff was impressed with Maltby’s research, and she launched Corning’s new test kitchen in 1931. Brumagen says Maltby immediately had a strong influence on Pyrex design and expanded the company’s reach into the home-consumer market. “She had a whole staff of people, including field agents who would meet with department-store managers, give demonstrations, and talk to customers directly. Matlby’s staff read thousands of letters from consumers, making notes and reporting back to her about complaints or things that they were doing right.” Maltby ensured that the all-male sales crew underwent a thorough training with Pyrex products in her test kitchen, as well as typical household chores. Left, an ad for Pyrex mixing bowls from 1946. Right, Dr. Lucy Maltby, Charles Oliver, and June Packard discuss a new product line in 1954. Courtesy the Corning Museum of Glass. Although Corning still made Pyrex products for laboratory use, its kitchenware became the biggest seller. Corning’s many innovations helped the business to quickly respond to American cooking trends, such as the popularity of home coffee brewers, shrinking oven sizes, or the spread of standardized baking mixes. “Pyrex pans originally had all these different sizes, and some were just one eighth of an inch bigger than others,” says Brumagen. “Maltby saw that this was too confusing, and wanted to simplify the line. She took a special interest in creating certain standards and making them suitable for kitchen use.” While working at Corning, Maltby also published cookbooks and completed her doctorate. At a time when it was uncommon for women to have professional careers, Corning relied on its many female employees to create products that women would actually want to use. “You had this dichotomy between the image of the homemaker women they were selling to in the advertisements and this whole army of women who were involved in the process behind-the-scenes, from design to quality-control inspections,” says Brumagen. Innovations in manufacturing were also making Pyrex a household name. Like the Palomar telescope disk, the earliest Pyrex cookware was made by hand, which limited its output. However, in the 1930s, advances made by engineers like Corning’s William Woods allowed Pyrex to be mass-produced using machine-pressed glass molds. Left, glass cookware was advertised as a useful material to conserve metal during World War II. Right, Silver Streak electric irons were made from Pyrex glass in 1946. Courtesy the Corning Museum of Glass. In 1942, the Museum of Modern Art praised the functionality of Pyrex designs by featuring several products in its exhibition “Useful Objects in Wartime under $10.” Around the same time, the company was developing a line of tough white dishes for military mess halls made from tempered soda-lime instead of borosilicate, making them less heat-resistant but also less likely to shatter when dropped. 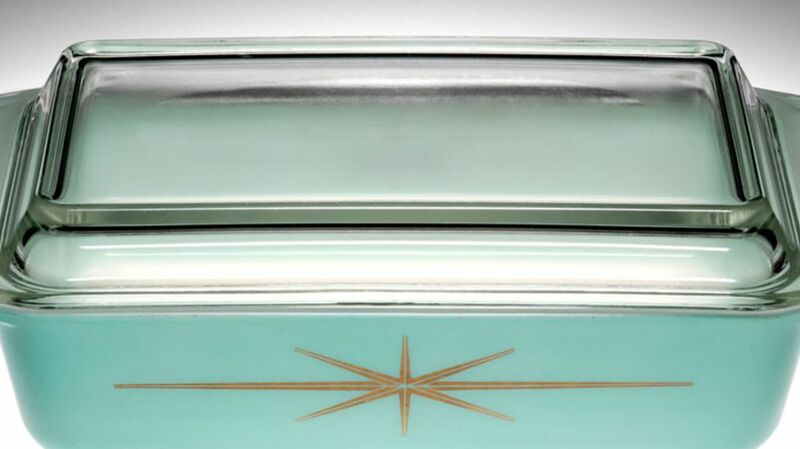 After World War II, this military glassware evolved into the brand’s popular Opalware line of kitchenware. The white glassware’s decorative appeal took a backseat until the end of the war, when Corning’s consumer division realized that Americans wanted more colorful objects in their homes. “They really had this craving for something new,” says Brumagen, “something colorful and bright and cheerful, and you saw the introduction of primary colors. I imagine it had something to do with the end of the war and a desire to live it up a little more.” In the late 1940s, competitor Anchor Hocking‘s Fire-King label also took off, as its temperature-resistant dishes made in classic Anchorwhite and green Jade-ite materials were adopted by restaurants, schools, and military bases. From that point on, Pyrex needed distinctive decoration and was designed with an increasing variety of colorful shades and patterns, usually painted onto white Opalware glass. From the ever popular primary-color mixing bowls to dishes in turquoise, pink, and avocado-green tones, Pyrex fit perfectly with the Mid-Century Modern aesthetic. While some patterns were quickly dropped due to slow sales, others, like the Snowflake, Gooseberry, Dots, and Daisy designs, were produced for decades. Eventually, the brand also catered to the demands of home microwaves with glassware and recipes geared toward the time-saving device. In addition to its familiar cooking products, over the years the Pyrex label also encompassed household objects like baby bottles, thimbles, and electric irons, as well as its line of laboratory glassware, which included beakers and test tubes. Pyrex remained the company’s top-selling brand until it was overtaken in the 1970s by Corningware, a line made from a combination glass-ceramic formula produced since the late ’50s. Primary Color refrigerator dishes by Pyrex, circa 1950s. Courtesy the Corning Museum of Glass. This article originally appeared on Collectors Weekly. Follow them on Facebook and Twitter.